I am sitting at the airport here in Houston, waiting for my flight to Frankfurt and then on to Nice, in the South of France. That will be followed by a 45 minute drive along the coast to the quaint town of Saint-Raphaël. So, if you are reading this around the time it was published today, I will likely be in that car, anxiously hoping to get to my hotel where I can take a nap. Some think that it is a bad idea to nap once hitting Europe, but I know I will not sleep on either plane nor in the car–I never do. So shed a tear for me. Here are my reminders for the day. As I mentioned a couple of weeks ago, the Oregon Wine is once again sponsoring the Oregon Wine A-List Awards. They are looking for restaurants across the globe that have stellar representations of Oregon wines on their wine lists. Do you have any in your corner of the world? If so, you should provide the Board with all the details so they can spread the word! All the details can be found HERE. 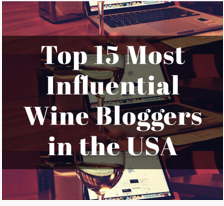 Yesterday, Snooth.com published another wine writer round-up (or something like that), and once again thought it wise to include me. Before any of you start questioning their collective wisdom, I have met a few of the people over there and they do seem to be rather bright. Yeah. I can’t figure it out either. This entry was posted in #MWWC27, Wine. Bookmark the permalink. Have a safe trip and a wonderful weekend! Our collective wisdom is pretty good. Next time we are all together, we should all bring one of the well-aged wines we mention… what a party, right? Cheers & safe travels! Are you settled in Houston? Not sure that will ever happen…. Hope your hotel in St-Raphael is up on the hill. Great views of the Med from up there! Take a short nap, then carry on with your day if you are staying in Europe for any longer than 5 days so you can get on their schedule as quickly as possible. That was what I did on my once yearly treks to France. Bon voyage! That has been my approach as well!